What can I say about this buck that his pedigree doesn't already say for itself...Genetically, he has so much to offer, combining some of the best of the Lucky*Star herd. Felix is a son of SGCH Lucky*Stars RY Acclaim 3*M EX92 and +*B SGCH Lucky*Stars AV Xavier EX93. He has such impressive genetics with every relative in his immediate pedigree being very accomplished including SGCH Accolade 3*M EX92 (aunt), SGCH Xhibit 2*M EX92 (maternal granddam), SGCH Vivian 4*M EX94 (paternal granddam) as well as up and coming yearling milking full sister Epic. Felix already has 2 Jr Championships under his belt with a young stock appraisal score of VEcV overall V and is qualified for the Young Sire Development Program. We are very happy with Felix, he is flat boned, open, and wedged shaped when viewed from the top. He is correct on his feet and legs showing the ideal set and angulation to the rear legs from both the rear and side profile. We have been pleased with his 2016 kid crop. We retained three daughters and two of them were named Best in Show their first time out and were the 1st Place Jr Get of Sire and Best Three Jr Females at the 2016 Colorado State Fair. We are thrilled to add a Vivian son to our herdsire lineup. Vivian has done everything you could ask a doe to do. She's shown well, appraised well, and milked well, being in the top ten several times and producing over 3,000 pounds on multiple lactations. She's one of only a handful to have a 94 LA score and was 1st Place 2 yr old at the 2007 ADGA National Show over 55 entries. Prior to the 94 at the age of 9, she LAed at 93 EEEE as a 6 yr old, 7 yr old, and 8 yr old, all under different appraisers. 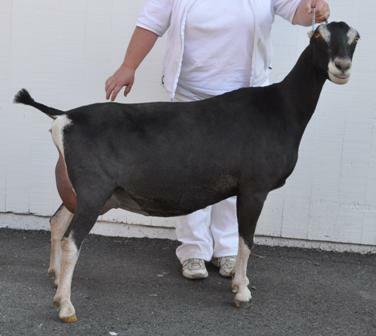 She's proven herself to be a strong brood doe, some of her offspring including SG Lucky*Star's AV Yvonne II 5*M EX90, SG Lucky*Stars AV Zsa Zsa 5*M EX90, SG Lucky*Star's RA Cher, SG Lucky*Star's TA Bette Davis 5*M EX92 (1st Place 4 yo 2015 ADGA National Show), SGCH Lucky*Star's AZ Anjelica 5*M EX91, and her son, SGCH +*B Lucky*Star's AV Xavier EX93. To say we're excited about Houdini is an understatement.